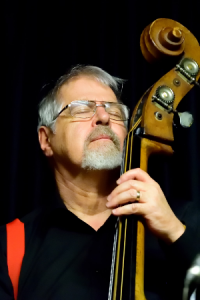 A self-taught orchestral bassist from the age of 14, Allan Wilcox discovered his ability to play jazz in a Kent pub in 1979 when the bassist in a trio he had gone to listen to was suddenly taken ill, and he was asked to stand in. ‘Just play the notes you’re sure of,’ said the pianist, and Allan found he was sure of more than he had expected to be. Since then he has played regularly throughout Britain, in Europe and in the USA with bands including Roy Potts’ Five and a Penny, The Original Panama Jazz Band, Ray Hayes’ Roaring Twenties Jazz Band, Bricktop’s Jazz Babes, New Orleans Express, Gary Potter, Delta Jazz, Max Collie’s Rhythm Aces, Barry Palser’s Savoy Jazzmen and Billy Thompson’s Gypsy Style. Alongside his musical pursuits, Allan is an accomplished theatre director and a Licensed Reader of the Church in Wales.